Boy the air line must be really hard up to associate themselves with such a huge weiner. 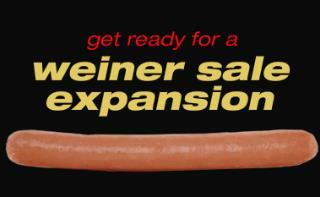 They should combine this deal with a hotel and call it "Weiner and Get a Room Sale". When you are hard up and need a place to stay a while. PS: give them free wi fi. This is why Newser needs to hire me! This is old news!! This came out like 2 weeks ago! We're just covering it now? So once on board will they be serving.... A "Weiner" on a bed of "Dominique Strauss-Kahn" french fries?